Unnecessary antibiotic use and misuse directly contribute to the rise in resistant bacteria. Antibiotic Awareness Week promotes cautious and correct use of antibiotics to help prevent and control the spread of bacteria that develop resistance to the medications. Think you need antibiotics for a cough or cold? For the flu? Sinus aches? Cloudy pee? Toothaches? Think Twice. Seek Advice. Antibiotics don’t work against your common cold and flu viruses, and are unnecessary for some common bacterial infections. Overuse or misuse of antibiotics can cause bacteria to develop resistance to these drugs—making antibiotics less effective when you need them the most. Ask your health professional whether antibiotics are the right treatment for you. Why a campaign for antibiotics? • Canadian clinicians prescribe 33% more antibiotics than clinicians in countries like the Netherlands, Sweden and Germany. 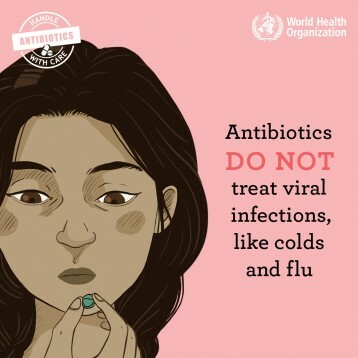 • For OECD countries overall, 3 out of 5 antibiotic prescriptions were for diagnoses considered inappropriate such as common colds and related symptoms (e.g., sore throat, cough). Antibiotics are lifesaving medications that we rely on to fight and prevent infections. The long lifespans we enjoy, we owe in large part to antibiotics. But despite their potency, like most medications, antibiotics have limitations. Antibiotics only work to treat conditions caused by bacteria, not those caused by viruses. Antibiotics may also kill some protective bacteria, and may cause some harmful side-effects. These harms alone are reason enough to avoid unnecessary antibiotic use; some bacterial infections resolve without treatment. But there is also the risk of antibiotic resistance. Germs like bacteria change when exposed to antibiotics in the body. They develop characteristics that allow them to fend off or disable antibiotics. Bacteria that develop this ‘resistance’ are not killed and continue to multiply. Resistance in bacteria can pass to other bacteria in your body. They can also be deposited in the environment (water, soil), or spread to others in your family, community, or hospitals. When disease-causing bacteria are ‘resistant’ they can become difficult or impossible to treat. In Canada and around the world there are increasing reports of treatment failures, where resistant bacterial infections are no longer responding to antibiotics. This is already seen for some common infections, like pneumonia and gonorrhea. This means that many procedures that we rely on will be risky. Routine operations like hip replacement, cesarean section, or appendix removal will become riskier. Without effective antibiotics, patients receiving chemotherapy and others with weakened immune systems will be poorly protected. Although Canadian data are limited, experts estimate that in some Canadian provinces tens of thousands of illnesses per year result from resistant bacteria. By 2050, if we continue using antibiotics as we are now, approximately 10 million people worldwide will die from resistant organisms each year, which is more than the number of deaths caused by cancer. Responsible use of antibiotics can help slow the tide of increasing antibiotic-resistance. Action is needed at all levels—individuals, governments, major organizations—and by all nations. You can safeguard antibiotics and your health by using antibiotics cautiously, only when necessary, and only as prescribed. Only take antibiotics prescribed to you for your particular illness, and carefully follow medical advice on the dose to take, and how long to take it. Begin by thinking twice—question assumptions and ask healthcare providers for advice. Everyone can help limit the misuse and overuse of antibiotics, and combat antibiotic resistance. Explore and share the resources below to help keep antibiotics working for you, and for all Canadians. ‘Think Twice’ about whether antibiotics are needed or not for some common illnesses like coughs, colds, flu, sore throat or sinus pain. Seek advice from your healthcare provider on the treatment that is right for you. Be aware of the risks and human costs of drug-resistant bacteria. See the personal stories shared below. A complete and high-quality source of information for the public, this website provides videos and specific information about antibiotic use and antibiotic resistance. Learn about when and when not to use antibiotics—use the pull-down menu to learn more about conditions that concern you. Learn more. This 12-part online guide, produced by Do Bugs Need Drugs?, helps you build knowledge on appropriate antibiotic use. It begins with understanding that not all ‘bugs’ are the same: many do not respond to antibiotics. Learn about types of microbes that cause illness, how to wash your hands to effectively stop the spread of infectious illnesses, treatments for symptom relief, and what signs or symptoms signal the need for medical attention. Learn more… click here. Learn more about the use of antibiotics and dental care, and why they may not be needed for every condition. A factsheet and other resources are provided by AntibioticWise.ca, B.C.’s leader on antibiotic awareness. “Preventing infection”: this video shows how antibiotics fight and prevent infection and can help in modern dentistry practice. Produced by Public Health Ontario, this series of 5 factsheets provides guidance on antibiotics and when they are not needed for some common infections. Topics include: Ear Infection, Sinus Infection, Sore throat, Bronchitis, and Do you need antibiotics? Resources from the Public Health Agency of Canada (PHAC) help prevent antibiotic resistance, with information on its causes, impacts and which bacteria and illnesses are antibiotic-resistant. PHAC also offers prevention tips and advice on when and how to use antibiotics. This animated video introduces you to your ‘microbiome’, challenges common assumptions about antibiotics, and arms you with questions to ask healthcare providers. Produced by Biomedical Communications students with support from the Sinai Health System–University Health Network. Watch it here. Why is Antimicrobial Stewardship Important? A video explaining antimicrobial resistance and what it means to be a ‘steward’ of antibiotics, including getting patients the right antibiotics when they need them. Shared by a Canadian leader in stewardship, the Sinai Health System-University Health Network. Watch it here. Produced as part of the 2018 Antibiotic Awareness Week, these materials include an article entitled Do you REALLY need antibiotics for that cold or flu?, a short video and a four-question quiz. The materials promote prevention in an effort to control the spread of bacteria that develop resistance to antibiotics. Find out more: click here. What happens when antibiotics stop working? Learn about the possible harms of drug-resistant bacteria from those who have experienced an infection during a hospital stay, while traveling, or from an unknown source in their community. Let these stories inspire you to learn and do more to use antibiotics wisely. Share them on social media to help build awareness. Mary’s story chronicles a nine month collection of family emails after she caught an infection post-surgery. The email subject lines were alerts, meant to be opened immediately, and at times a call to action. Read her full story here (Source: Health Canada). Lill-Karin, Norway, caught bacteria resistant to many antibiotics after an accident and a hospital stay while on holiday abroad. The strain of bacteria was so resistant that there was only one antibiotic available that could be used to treat it. She spent a long time in and out of hospitals to get rid of the infection. Read her story. Paolo fell ill with a serious urinary infection with an E.coli resistant to many antibiotics. It took two months and three courses of different antibiotics before Paolo’s infection was successfully treated. Nobody knows where he picked up the infection. Read his story. In the interest of quality patient care and public health, healthcare professionals have a responsibility to prescribe antibiotics only when required and to select the right drug, dose and duration. Members of the healthcare team help patients and their caregivers to weigh the risks and benefits of antibiotic use, and offer guidance on symptom relief when antibiotics cannot help. Below are links to several evidence-based tools and educational resources developed by clinical leaders and champions of antibiotic stewardship. 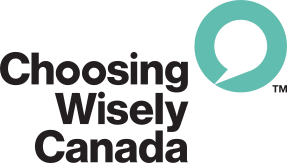 Choosing Wisely Canada’s antibiotics campaign website provides information about how to use antibiotics wisely. Recommendations for primary care, hospital and long-term care prescribers, prescription handouts (viral prescription & delayed prescription), posters for patient waiting rooms, and other patient resources are also available for download to use in your practice. Access here. The Association of Medical Microbiology and Infectious Disease (AMMI) Canada, has developed bilingual resources freely available for download to stop inappropriate antibiotic use for asymptomatic bacteriuria in long-term care residents. Acute care resources coming soon. To read the Symptom-Free Pee: Let It Be, click here. #ASPchat is a monthly, real-time Twitter Chat that aims to promote appropriate antibiotic use by stimulating conversation about antimicrobial stewardship. Chats are open to all and run on the third Thursday of each month from 7-8 PM EST. Join the November 15 chat “Antimicrobial stewardship and awareness for the cause,” and follow @ASP_chat for news of more upcoming events. Healthcare providers and public health leaders are witnessing the human and health system costs of antibiotic resistance, in Canada and around the world. Their stories illustrate adoption of effective practices or policies, and improved outcomes for patients. Read and share stories that inspire you to act on the threat of antibiotic or antimicrobial resistance. The emergence, development and spread of pathogenic organisms resistant to treatment by antibiotics and other essential drugs is a worldwide public health concern. The knowledge and capabilities of all nations must be harnessed to combat antibiotic and antimicrobial resistance (AMR). Several allied awareness campaigns are featured here, listed by country. Foremost among them is the global campaign, led by the Tripartite Collaboration (WHO/FAO/OIE). Together, these initiatives illustrate the emergence of a vast international movement to mobilize against AMR. Antibiotic Awareness Week, November 12-18, 2018, is a time to raise awareness for correct and cautious use of antibiotics to help control the increase in resistant bacteria and hard-to-treat infections. Held every November, the event coincides with World Antibiotic Awareness Week, led by global champions for the responsible use of antibiotics. In Canada, the campaign is led by the National Collaborating Centre for Infectious Diseases (NCCID), joined by leaders in public health, antimicrobial stewardship, quality healthcare, and patient safety. This year our focus is Think Twice. Seek Advice, asking Canadians to check their assumptions and speak to their healthcare providers about when antibiotics are needed and when they are not. Areas of emphasis for this campaign are common respiratory infections and suspected bladder infections among the elderly—where misuse is common—as well as dental care. Improved awareness on when antibiotics may not be called for can lead to improved use and help limit the harmful effects of drug resistance. On this page, visitors will find many resources to help promote the appropriate use of antibiotics. The public will find informative videos, factsheets, quizzes as well as links to more comprehensive educational resources and allied campaign websites. For providers, there are evidence-based clinical practice recommendations and patient education tools to download and share, as well as aids to antibiotic stewardship program planning. Follow @CentreInfection on Twitter to share campaign messages and materials during Antibiotic Awareness Week, November 12-18, 2018. Please return to this webpage to see what’s new, as more resources will be added. At the National Collaborating Centre for Infectious Diseases, we specialize in forging connections between those who generate and those who use infectious disease public health knowledge. Working across disciplines, sectors and jurisdictions, NCCID is uniquely situated to facilitate the creation and operation of networks and partnerships. From policy to practice, we’re able to build bridges between those with infectious disease questions, those with answers, and those in a position to act on the evidence. NCCID is funded by the Public Health Agency of Canada and hosted by the University of Manitoba. For more information, or to ask how your organization can endorse the campaign, please contact the National Collaborating Centre for Infectious Diseases.